I’m not going to say this is the best game ever, but Mario Kart 64 ate up a good chunk of my time on Christmas Day, 1996 (I think). Since that time I’ve got myself a Game Cube and waited (patiently) to purchase (or receive as a gift) a cart-racing game of similar stature. 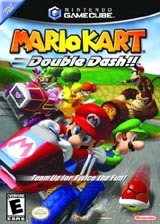 Mario Kart: Double Dash (technically, Mario Kart: Double Dash!!) is that game and I have not been disappointed. Jenn and I played this game for what must have been 2 hours straight (until about 2am yesterday morning) and woke up wanting more. It needs a few more tracks and more unlockable goodies, but so far it’s a great way to spend some time pushing buttons and contorting your face to make those hairpin turns. Two thumbs depressed on a joystick! Penny Arcade weighs in on Mario Kart: Double Dash!! A scholarly breakdown of the baddies in Mario Kart: Double Dash! !